Fire Exit Theatre proudly announces the winners from the inaugural Scripts on Fire New Play Competition. Our jury consisted of – Dr. Tara Laberge, Peter Church and Jason Hildebrand. Karen is originally from Texas and moved from New York to Victoria in 2003, completed her MFA in playwriting at the University of Victoria, and has led writing workshops for the Victoria Immigrant and Refugee Center, South Park Family School, Sunrise Waldorf School, and Intrepid Theatre. Her plays have been produced at the Toronto Fringe, Vancouver Fringe, and Victoria Fringe premiere. She spends most of her time as artistic director of the Greater Victoria Shakespeare Festival. 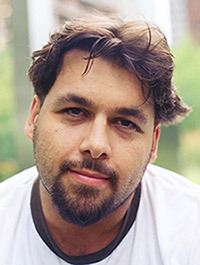 Gilbert is an Edmonton based writer and playwright. He has had two productions in the Edmonton Fringe Festival, co-written a short film “Detached”, and a short story collections printed and distributed as postcards through the mail. Gilbert currently spends his daytime hours working for a local professional hockey team. He is thrilled to be working with Fire Exit Theatre. Father Caleb opens his church in the heart of a city gripped by a deadly epidemic. He works to offer people hope, but soon there’s more: people taking Mass are no longer suffering the sickness. As the church’s legend grows, Dr. Laynie Unwin, lead scientist on the search for the cure, comes to investigate this miracle. Is the cure in the wine, or in the faith of the people? Through this unlikely reunion, old friends Caleb and Laynie will fight over their past, their divergent world views, and the very lives of the city itself: all to prove what they believe to be true. Peter has been a professional actor for 15 years and has also written numerous audio dramas and stage plays including; The Other Celia, I Smell a Mystery, and an adaptation of It’s a Wonderful Life which has been produced in Vancouver, Chicago, Detroit and the Yukon. Part storyteller, part creative-catalyst, Jason leads Jason Hildebrand Creative Arts, where he serves as an actor, producer, writer, filmmaker and communications coach. His solo performances include; The Prodigal trilogy, Blue Like Jazz//Live, Life of David, Kingdom of Herod, and Breathe with jazz pianist Mike Janzen. This past Christmas he released ha multi-cast radio play adaptation of his short story The Wooden Angel. Tara has a multidisciplinary career that spans Opera, Music Theatre, Theatre, and Collaborative Creation. She has performed with the Calgary Festival Chorus, the Calgary Philharmonic Orchestra, and the Calgary Youth Orchestra. Acting credits include Shadowlands, A Christmas Story, No Exit, The Savannah Disputation and Carousel. Tara is a member of the theatre faculty with Ambrose University where she teaches Music Theatre Voice, Music Theatre History and Art and Faith.